Do you see that? Look on the horizon. Spring training is slowly moving closer. Twins pitchers and catchers will soon be reporting to Fort Myers with position players following close behind. Before the Twins make their annual trek south, it’s important to look at some of the key aspects facing the club in 2019. In the coming days, multiple keys will be identified and addressed. Minnesota has a chance to win the AL Central for the first time since 2010. For that to happen, certain things will need to work in the club’s favor this year. First on the list is the emergence of Mr. Byron Buxton. Byron Buxton didn’t finish last season in Minnesota. The organization decided not to make him a September call-up. In doing so, the club picked up an extra year of service time as Buxton now won’t be eligible for free agency until 2023. There were high hopes for Buxton entering the 2018 campaign. He ended 2017 on an upswing as he hit .300/.347/.546 with 23 extra-base hits in the second half. However, the 2018 campaign quickly turned into a nightmare for Buxton. He only managed to play 28 games at the big-league level while hitting .156/.183/.200 with four extra-base hits. He struggled through injuries and spent time trying to find his swing in the minor leagues. Some players take time to develop. In recent memory, Aaron Hicks was a player that took some time to figure it out at baseball’s highest level. Since leaving the Twins three years ago, he has been the tenth most valuable outfielder in the American League. Another former Twin, Joe Nathan, didn’t see his career take off until being traded to Minnesota and becoming the team’s closer at age 29. Baseball is a funny game. Sometimes it pays to be patient, especially with a player like Buxton who seems to have endless potential. Buxton is the one player on the Twins roster who can impact the game in every way. He’s shown the ability to be the best defensive player in the league. He can drive teams crazy on the bases with his ability to turn a single into a double or move from first to third on a slow roller to the outfield. The Twins don’t need Buxton to hit. 350 and crack 40 home runs. His defense and running ability make him valuable without even considering his hit and power tools. A healthy Buxton could result in more of what Twins fans saw in the second half of 2017. Buxton showed his ability to hit for average and to post some strong power numbers. Minnesota’s next window of opportunity is right now, and Buxton’s emergence is key to the club moving forward. Miguel Sano is an important piece as well, but Buxton can impact every facet of the game. If Minnesota sits atop the AL Central at season’s end, Buxton was likely part of the team’s success. Baseball’s former top prospect is only 25-years old so there is no reason to give up on him now. Buckle-up Twins fans because Buxton could be just one key component to the team’s success next season. He is a threat to break out at any moment. 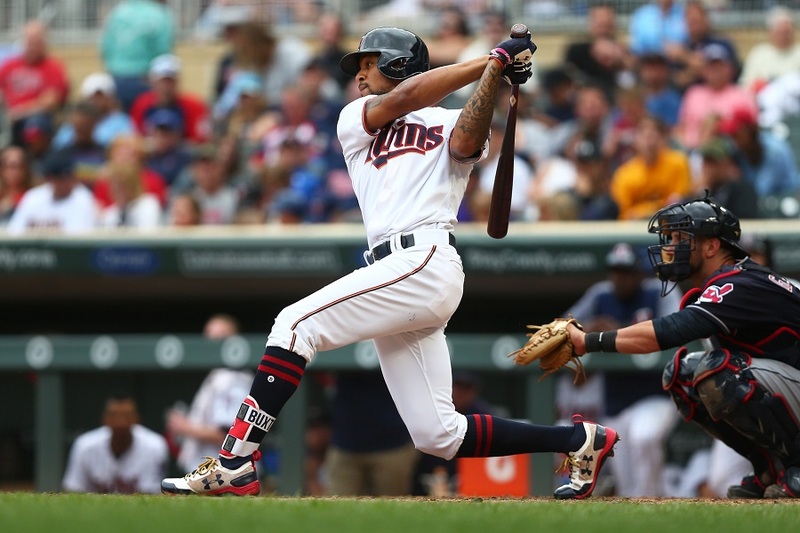 How important is Buxton to the Twins in 2019? Leave a COMMENT and start the discussion. People often point to Hicks as the comp, and perhaps correctly so. But it took him until 27 to become a solid player. Torii Hunter didn't light anything up until his age 25 season, then kaboom. Would much prefer to see Buxton follow 48's path. I'm not going to expect huge things, which I sometimes find is the best way to get them. Haven't I read this essay before?Last year?The year before? With Buxton’s defense they can be incredibly patient with the bat even if it takes as long as Hicks. If he would learn to bunt like Rod Carew, good things will happen for him and the Twins! He should attempt to bunt once a game. Infielders play in more making bigger holes in infield. Infielders hurry there throws resulting in more errors. When he gets on base in a blink he could be standing on 3rd! I believe scoring runs is still the best way to win.I love defense, but without offense nothing works. This apparently has become a Twins mantra in some parts. I'm like everyone else; I'm all in on the Buxton we briefly saw in the latter half of 2017. However, and not to be a naysayer, if our entire success or failure rests on the shoulders on Buxton, I think that only intensifies his own personal struggles, which might not be such a good thing, since his troubles seem to be mental struggles as much as physical ones. Maybe the approach should be precisely the opposite; i.e., let's not count on Buxton for anything and let's see how things go. I have a completely different view of this picture. I don't think it is the case that the fate of the Twins rests entirely on the shoulders of BB. Cave has shown himself to be a decent player and can fill the role of CF if he needs to do it again. I am far more concerned about the pitching rotation. It looks shaky at best, but even that isn't a death blow at this point. That is to say, a lot of Twins will have to produce if the organization is to have a successful 2019 campaign. I hope one of them is Buxton, but he isn't Atlas--he needs lots of others to lift their corners of world as well. Let's hope he has 500+ ABs.That should be the best sign of all. The hidden benefit to preventing more runs at the cost of scoring fewer runs is the reduced burden on the pitching staff. If the differential is the same I believe the better team more often will be the one with fewer runs scored. It is a hidden benefit because the additional run prevention resulting from better pitching the rested staff will not show up in the data of the defensive players. If you believe in the Pythagorean win expectation the best way to improve a .500 team is to prevent runs even at the cost of scoring fewer runs. On the other hand if you are a bad team trying to get to .500 adding offense is the quicker path towards mediocrity. I am pessimistic - normally an optimist but in recent memory I do not have a "stud prospect" that has lived up to the hype in a twins uniform. The last one I can remember was Joe Mauer. I think we have to be realistic: when we're praying that our 25 year-old outfielder can hang on to the 8th spot in the batting order and hit.235 this year....maybe - just maybe - we shouldn't count on Bux being an important cog on the 2019 Twins. I hope he breaks out, just like everyone here. But I think we need to be more realistic about the type of major leaguer we have. His ceiling right now looks like a Jerrod Dyson-type. His floor? Well...let's just not think about that. I think Baldelli should only help Bux this year and I'm guessing he'll feel much more relaxed up there. Keeping my fingers crossed. But any major offensive contributions from Bux should be considered a bonus at this point, and we should keep our expectations very, very reasonable. Buxton's ceiling is higher than Jerrod Dyson. Buxton has already put up a 5.2 bWAR season. Dyson's highest is 3.2. Dyson may be Buxton's median probable outcome, but his ceiling is factually higher. I agree that Buxton is the key.I also believe he will take a major step this year.Call me overly optimistic, but he is too talented no to.Injuries have been a major hurdle for him.I feel the reckless abandon he plays defense with has hurt his offensive development because he gets injured and has to adjust.If he can play 150+ games this year, he will be fine.To me, his health is his biggest hurdle.If he stays healthy, he will take the step we wait for. If he can play 150+ games this year, he will be fine. If he is fine, he will play 150+ games. I think that's the way to look at it. If Buxton can stay on the field, the Twins are a better team. He doesn't have to be a great hitter in 2019, just make some progress. He has 1,087 career PA, or a little less than 2 years at the plate. Fangraphs has him for 4.6 career fWAR, Baseball Reference at 6.9 bWAR. He's an above-average player already. Buxton's mid-season injuries didn't require surgery. A ball off the toe and a strained wrist. I'm more worried about the migraines. I hope he tells Baldelli as soon as he has symptoms. I can't imagine trying to hit with that kind of pain. Actually I am in agreement, if I can get over the helpless flailing that I still picture with Buxton.I loved the Go-go White Sox of Fox and Aparicio that won on great fielding and good contributions from a below average offense, and also the period of Whitey Ball with Ozzie Smith and Lou Brock in St. Louis - run, field, pitch.Great ball clubs and I would love to see a team do that now. I hear this a lot, and not just with Buxton. There's an assumption hidden in here that may not be valid: that it is easy for players to learn to bunt. Is that really true? We never hear anyone say "if he would learn to hit like Rod Carew." We never hear anyone say "if X would learn to field like Ozzie Smith." Is it true that bunting is a learnable in a way that hitting and fielding are not? Lower the bar and dreams come true!!! This is how we baseball!! I agree with having him drag bunt at least once a game. What made Carew such a great hitter and bunter is how long he waited to make contact. See the ball, see the ball, hit the ball. I like the analogy of Carew and Boggs being like rattlesnakes--wait for the prey to come to you and then strike. Buxton is more a cheetah who chases after his prey right out of the pitcher's hand which doesn't allow him to see the rotation or read the pitch. I believe he could bunt every at bat for a higher average than his current MLB lifetime of .230; and if he bunts more often he will learn to see the ball and read the spin before committing or not committing to a swing. It is unlikely he will ever hit for average like Carew or Boggs, but they didn't hit for power like Buck is capable. I believe Buck is without doubt the key position player. Will he be that player? Let's just say I'm praying for it more than expecting it. Start and play him every day this season regardless of how he does. He has this year as a starter. If he can't figure out it, you use him as a defensive replacement and pinch runner going forward until he is no longer cheap to have around. I'm getting annoyed at the "is it time to give up on Buxton" messages out there. Do we all forget that he already had his breakout season in 2017? Sure, we all want him to be Mike Trout, but repeating his 2017 performance still makes him a perennial all-star candidate. My only concern is around injuries. Let's see the kid play injury free, and I expect we'll all be happy with the results. Let's see the kid play injury free, and I expect we'll all be happy with the results. If injuries have accounted for flailing at breaking pitches in the dirt, then I'm with you. Personally I think they are two separate provisos involved with our being happy with him. I don't disagree. My point is that if healthy, he's still good enough to be very valuable, even with the occasional flailing at pitches. My two favorite twins to watch were Mauer and Buxton. To me, Buxton was the most exciting player in baseball the 2nd half of 2017. What you say about standing on 3rd is true. Its not like he had a very good 80% stolen base average.It was 100% and the only time caught was an over slide. Bunting for hits is also a huge confidence booster.When he doesn't have to worry so much about average and contributing it loosens him up to play more like the 5 tool guy. Even when he was hitting great and for power I thought he should keep bunting.It had to drive the other team nuts. I don't think it is real easy but Buxton has already shown he can do it fairly well and lets face it, he doesn;t have to be as good as Carew.He is just so fast the bunts that get everyone else out he turns into singles.The only time I remember him bunting last year was a sacrifice try right back to the pitcher and Buxton still beat it out.